To the friendships as warm as the sun.. They are a big family because they made up a principle hospitality among the traditions. Hotel Turquoise resort & spa which situated in Side , in Sorgun pine forest that reaches out to the sea has been serving to its elit guests since 1988. While the guests select the hotel, they consider that its unique nature and nearness to the city center. 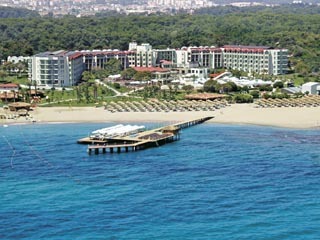 It has easy access to Side Centrum , Manavgat and Antalya Airport . Hotel Turquoise Resort & Spa which has its own 200m length sandy beach with two jetties is a special place for its guests to fish and sunbathe all day long. Unique location of the Hotel Turquoise Resort & Spa and its rooms which have forest and sea view give an opportunity for relaxation to the guests as much as they wish. 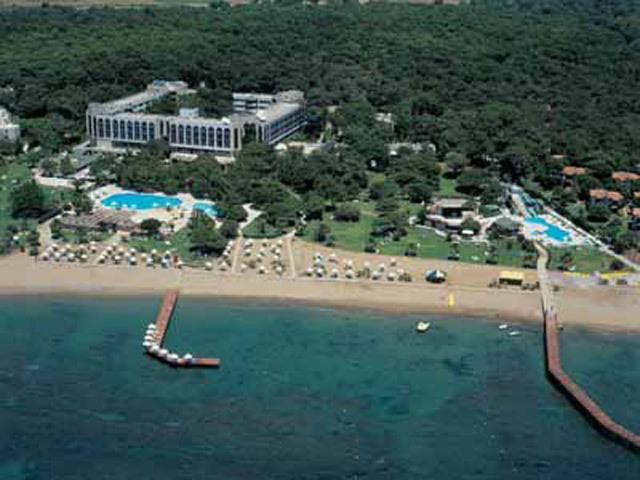 Turquoise Resort Hotel & SPA is situated in Side, in Sorgun pine forest that reaches out to the sea. 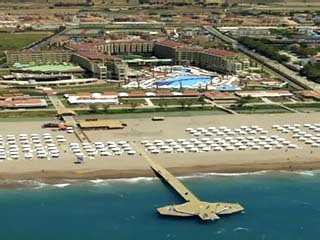 It has easy access to Side Centrum (3,5 km), Manavgat (4,5 km), and Antalya Airport (65 km), Taxis are available. Turquoise Resort Hotel & Spa was built in 1988 and is located in the middle of the Sorgun pine forest in 80.000 square meters. You can reach Side easily in 20 minute by walking. Turquoise Resort Hotel & SPA takes place just by the beach and has its own 200 m length sandy beach with two jetties, with 150 m and 50 m length at the sea. In Turquoise Resort Hotel & SPA you are offered the best by a high qualified team aiming only for full Guest Satisfaction. They will take care of the details for you! Come and enjoy the hotel's natural surroundings and the golden sandy Mediterranean beach while having a relaxing 20-minute walk to the ancient town of Side with its very rich culture and history. Savour the delicious gourmet cuisine, taste the most refreshing drinks and enjoy your vacation in full comfort , luxury and tranquility, and if you are looking for a change, the high-level entertainment will give you the opportunity to join various activities during your days and nights in the hotel. See the smile on your children's faces when they slide into the pool, join the Mini-club activities, and let them fill their tummies at their own open buffet!. The 3100 repeat guests prefer to enjoy their holiday in the hotel. Turquoise Resort Hotel & SPA was awarded with the “Service Quality Award” and the “Environment Protection Award”. 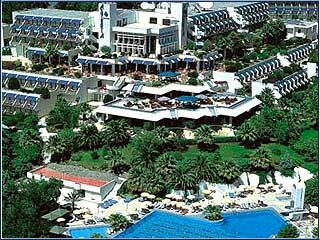 The main building of the Turquoise Resort Hotel & SPA has 240 rooms and 180 rooms are in the pine forest. In total 342 Standard rooms, 46 Suites and 32 Apart rooms. 34 rooms are Non-Smoking rooms. Standard rooms are designed to accommodate maximum three people. Suite rooms are designed to accommodate maximum four people. Apartments are designed to accommodate maximum four people. Disabled Rooms: Turquoise Resort Hotel & Spa has six rooms for its disabled guests. All the rooms are situated in ground floor with a special design. Four disabled rooms are in the main building and two of them are in the near blocks. Additionally for easy outlet accesses Turquoise Resort Hotel & Spa has platforms. The Turquoise Side Hotel offers various services and facilities covering in full the needs of the Business or Leisure traveler and adding to the main objective to make our guest's stay the most pleasant and comfortable. Entertainment: Turquoise Resort Hotel & SPA has sport activities for every day. The Animation team of Turquoise Resort Hotel & SPA presents different shows, scetches, musicals, folk dance shows and/or live music at the Amphi Theatre ervery evening. The themes change every 14 days. Turquoise Resort Hotel & SPA presents you a wonderful taste from World and Turkish Cuisine that serves in All Inclusive basis. Kervansaray Restaurant serves changable theme dinners with periods of 14 days. Theme Dinners are organized as Italian Night, Turkish Night, Mexican Night, Gala Dinner, Turquoise Night, Anatolian Night, Vienna Night, African Night, Asia Night, Oriental Night, International Night and Fish Night. You can enjoy the preparation of the dinner meals by watching the cooking stations. A-la-Carte Restaurants: Three A La Carte Restaurants are serving with their elite menus. Kebap House : Some sorts of kebaps are served . Ristorante Napolitan : Samples of the Italian Cuisine are presented. Turquoise Restaurant : Some fish sorts are served.